It’s the last day of November, which means it’s the last day of NaBloPoMo. Let’s take a quick look back at the month. There were twenty-six blog posts. Seven sweets. Three salads. Three soups. Four other assorted vegetables. I bought a pressure cooker and am still trying to figure out how to use it. I got raw kale to finally work for me. I tortured you with the study of words and the study of microbes. I gushed about two inspiring chefs*. I traveled to Philadelphia and thought about The Netherlands and Miami. Writing every day has been invigorating. More food has come out of my kitchen in the past month that any other month ever. Many nights I couldn’t fall asleep because I was too excited about what I wanted to write the next day. And some days it was a struggle. I let you in. And you, probably for the first time, got a glimpse of how I was feeling. To top it all off, today I made bread. There’s a little more to that story, but for now, just a picture. It’s been quite a month. Thanks for joining me for the ride. See you in December. * For more on Ottolenghi, check out Jane Kramer‘s article in this week’s New Yorker (December 3, 2012). You can’t access the full article unless you’re a subscriber, but I’d actually argue that this issue — the food issue — is worth the price of the entire subscription. Good reading, folks. Good reading. Oh, and these are not just any cookies. 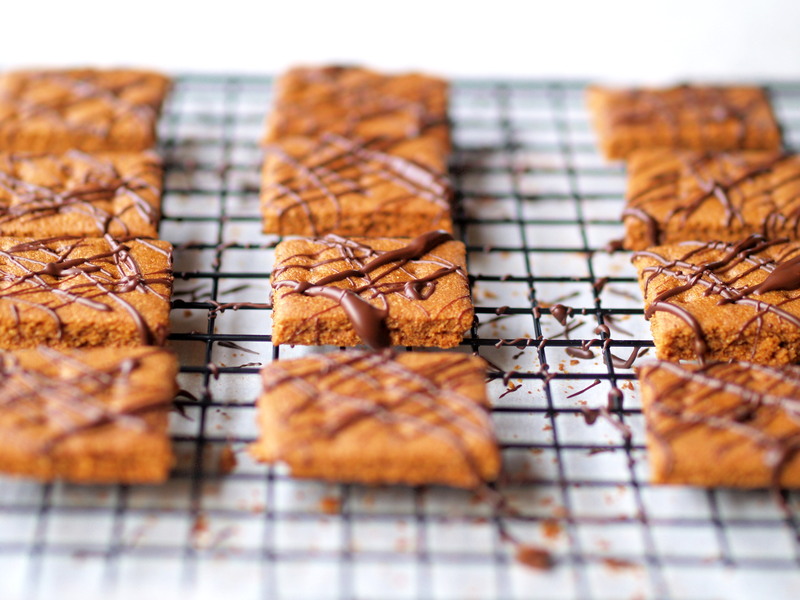 They’re chocolate-covered graham crackers. Let me say that again, for full effect. They’re graham crackers that I made (! ), that I covered with chocolate (! ), and that I didn’t eat all in one sitting (!). I will admit, however, that I also didn’t share them. I’ve been slow to jump on the DIY food bandwagon (actually, I’m generally slow with these bandwagon things), but I’ve made an exception for graham crackers. Because when the holiday lights and decorations come out of storage, and the carols play on every radio station, I think of chocolate covered grahams, pink grapefruit, and Chinese food. My mother’s mother was a snowbird, leaving her Manhattan home every October to spend the coldest months in Miami. Each December when my sister and I were kids, our parents drove us down from Maryland to the tip of Florida for two weeks of sun. As we pulled up to the building, no matter what time of night, Bubbie would be sitting in the lobby, perched between a twinkling plastic pine tree and an over-sized candelabra. Riding up the elevator, luggage still in the car, Bubbie would hand my father a list of chores – hang a picture, re-wire a lamp, fix a television. When the elevator door opened, my sister and I would grab the key and race down the hall, bursting into the apartment and making a beeline to the kitchen. In the middle of the table, next to a bowl of the pink grapefruits that Bubbie sliced and sectioned before every dinner, sat a plate of chocolate-covered graham crackers and two glasses of milk. We knew the deal. No milk, no sweets. We drank a lot of milk during those two weeks. The highlight of each visit was going to the kosher Chinese restaurant on Christmas eve. We’d order the usual – egg drop soup, mu shu chicken, beef with broccoli, and Kung Pao chicken. And a steak. Bubbie figured that if we were going out, she was going to go all out. I don’t like Chinese food, she would say. So we’d order the steak. The waiter would pile all the dishes on a lazy Susan in the middle of the table, and pass around plates. My grandmother would hand back her empty plate and place her steak plate in front of her. We’d spin the Susan to the pancakes, pass hoisin sauce under Bubbie’s nose, and then spin the Susan back to the mu shu. And Bubbie would smile and slice into her steak. Soon, she would sneak a fork into the mu shu. Then into the beef. She’d make room on her plate for rice, pushing the steak aside. It’s too tough, she’d say. We’d pass her the Kung Pao. My dad would finish the steak. Maybe one day I’ll bribe my own kids with some chocolate covered grahams. And then my grandkids. For now, though, they’re all for me to nibble with my coffee. Sorry Bubbie. I still don’t like to drink milk. I adapted Alton Brown’s graham cracker recipe, and frequently consulted Joanne Chang’s recipe in Flour (Thanks, Molly, for lending me your extra copy). You’ll need to give yourself enough time to chill the dough for 30 minutes before you can roll it out. Chill. Cut the butter into 1/4-inch cubes and place in freezer while preparing the other ingredients. Pulse. Place in the bowl of a food processor both flours, sugar, baking powder, baking soda, salt, and cinnamon. Pulse several times to combine. Then add the butter and continue to pulse until the mixture resembles cornmeal. Add molasses/honey, milk, and vanilla and process for about a minute until the dough forms a ball. Chill again. Press the ball into a 1/2-inch thick disk, wrap in plastic, and refrigerate for 30 minutes. Roll. Remove the chilled dough and divide it in half. Return the other half to the fridge. Roll the dough out between two sheets of parchment until it is 1/8-inch thick . Slice. Remove the top sheet of parchment and slide the other sheet onto a cookie sheet. You want to cut the dough into squares – a traditional graham cracker is 2 X 2 – but I made mine about 1.5 X 1.5 or so (I skipped the ruler). Use a pizza cutter and straightedge to make vertical and horizontal cuts all the way across the dough. Don’t trim the excess! (You’ll see why in a moment.) 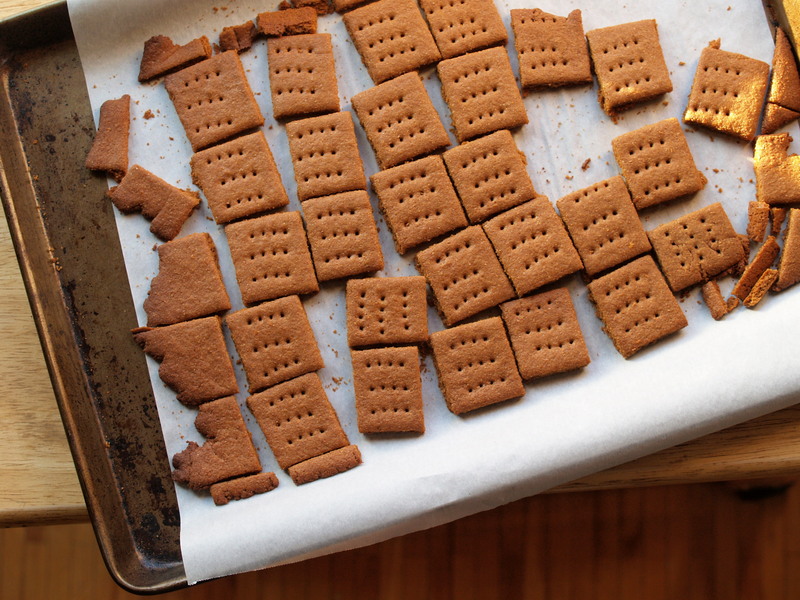 Use a fork to make holes in the crackers in whatever pattern you’d like. Don’t separate the crackers. Cool. Remove from oven, set the sheet pan with the crackers on a cooling rack and allow to cool completely. As the crackers cool, they’ll harden. Break. Once the crackers are completely cool (20-30 minutes), break them up. Temper. Fill a small pot with 1/2-inch of water and bring to a slow simmer. Chop the chocolate into small chunks and place half of them in a large metal or glass bowl. Place the bowl over the simmering water, making sure that the water doesn’t touch the bowl. Using a spatula or wooden spoon, mix the chocolate until it melts. Take the bowl off the pot and wipe away any moisture from the bottom. Slowly add the remaining chocolate pieces, continuing to stir until each small addition melts, and then add another pinch or two. The chocolate will start to get glossy. The more you stir, the glossier your chocolate will be. If you have a candy thermometer, keep stirring until the chocolate reaches 90ºF. No thermometer? No problem. Keep stirring and after about 15 minutes, dip a metal spoon in the chocolate, and then stick it in the refrigerator for 2 minutes for dark, 5 for milk. If it comes out set and glossy and not tacky to the touch, it’s perfect. If it’s still sticky – it’s not cool enough, and not tempered, so keep mixing and add any remaining chocolate pieces. Drizzle. Lay the cooled crackers in a cooling rack. 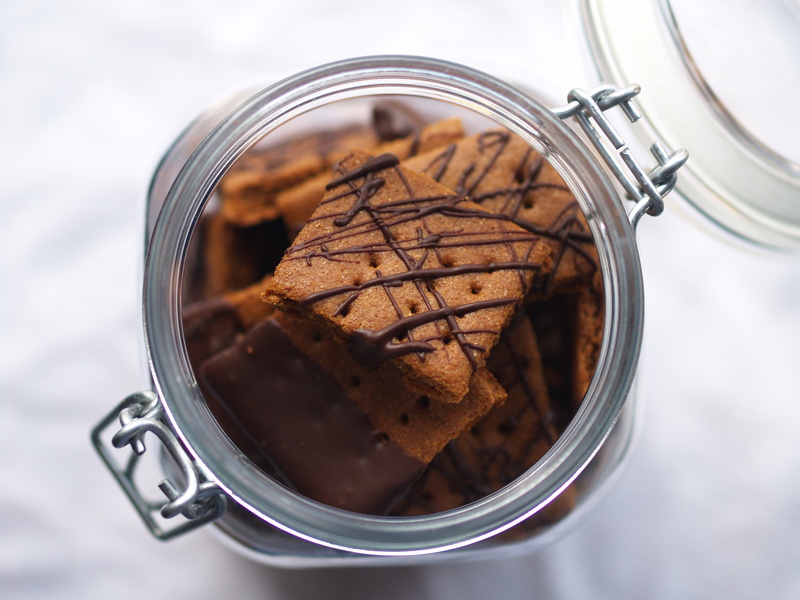 Drizzle the chocolate in a crisscross pattern over the crackers. Let the chocolate harden. Dip. 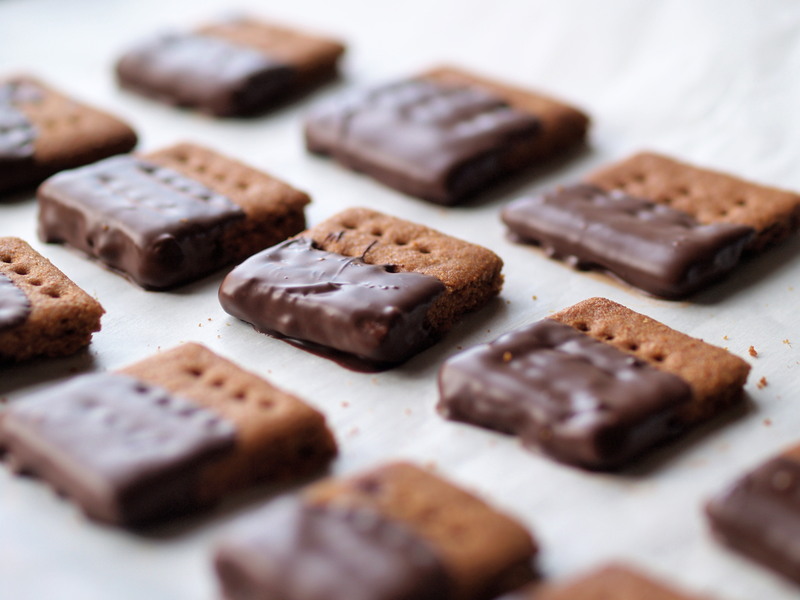 Dip each cracker in the tempered chocolate, coating half of each side. 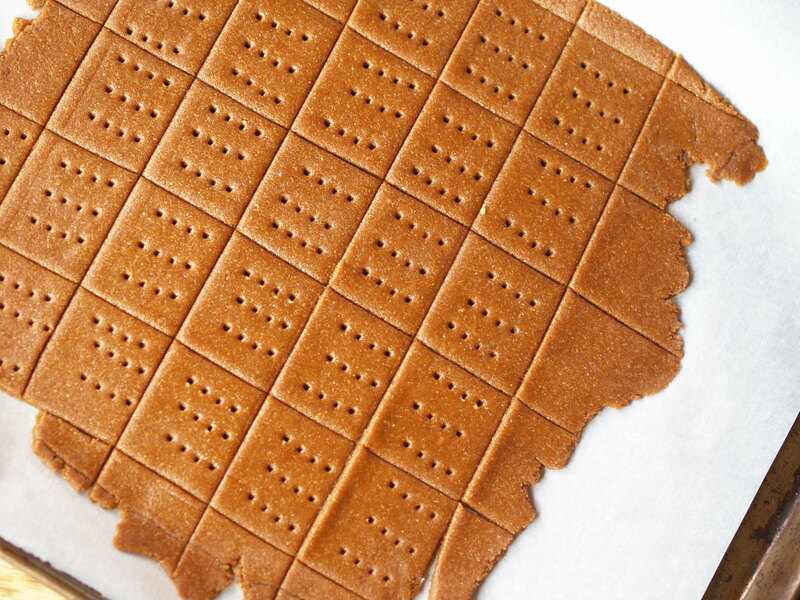 Lay the dipped crackers directly on parchment. Eat. Don’t forget the glass of milk. Store. Store in an airtight container for up to two weeks. Today was a salad-for-breakfast kind of day. And a salad-for-lunch-kind of day. And a salad-for-dinner kind of day. Not only that, it was a kale-salad-for-breakfast-lunch-dinner kind of day. I was pretty late to the kale game. My first ever taste was nearly four years ago when I bought a big bunch of kale to help me decide whether to join a CSA. I had heard that in bad years, even in good years, you can go weeks on end with little more than kale and a few carrots in your weekly vegetable box. So I made a kale soup. I did end up buying into CSA, but the soup was decidedly on the con list, despite what may have I told you at the time). And then for years, kale disappeared from my blog. It disappeared from my kitchen. It even disappeared from my CSA box (every week, I found some pour soul to trade their tomatoes/chard/potatoes/tomatoes for the prized kale; yeah, you never want to share food with me). But it’s back, my friends. Kale is back. And with a vengeance. Three times this month. Thrice! I took baby steps at first, using delicate tender baby kale leaves in a salad and a soup. And then, I dove right in. I skipped over the mild lacinato (dinosaur) variety and went straight for the red Russian. Imagine biting into curly parsley when you’re expecting Italian flat-leaf. That’s the difference between red Russian and baby kale. But mix some kale with a little oil, a little acid, a little salt, and we’re in business. The leaves wilt just enough to become not merely palatable, but delicious. They absorb the flavors and then hold them in while resisting the wilt that their less hardy brethren are so prone to. Dress it today, eat it tomorrow. Or, if you’re like me, dress it today, eat it this morning, this afternoon, and this evening. 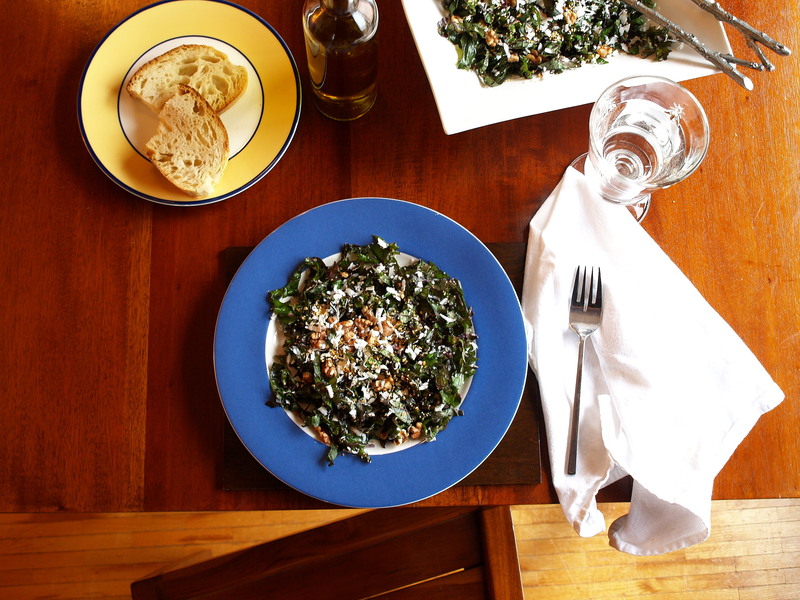 I started this salad with Kim Severson‘s version (also reprinted in the New York Times where Mark Bittman called it The Kale and Ricotta Salata Salad, as if it were the only one worth knowing!) and then added parsley for its fresh flavor and toasted bread crumbs and walnuts for some crunch. Ricotta salata is ricotta cheese that has been pressed, aged, and dried. It is solid, but can crumble. If you can’t find it, a sheep’s milk feta could substitute (I like Pastures of Eden brand). Blitz. Break the bread into pieces, including the crust, and then blitz in food processor or blender until you get large crumbs. If your bread isn’t stale, dry it out by placing it in the oven with the walnuts for about 5 minutes. Toast. Spread the walnuts and bread crumbs out separate baking sheets and toast for about 10 minutes until fragrant and slightly golden. Drizzle the tablespoon of olive oil over the bread crumbs, sprinkle with salt, and mix with your hands. Whisk or shake. Cut the shallot into several large pieces and mince it in a garlic press (or chop it very fine) into a bottle or bowl. Add the 1/4 cup oil and the juice of the lemon with a large pinch of salt and a few grinds of pepper. Shake or whisk until emulsified. Slice. Trim the leaves of the kale above where the stems become thick. Stack the leaves in a pile, roll them like a cigar, and slice it thin crosswise. Chop the parsley. Assemble. Scoop the kale and parsley into a large bowl and add the dressing (this recipe makes the right amount of dressing for the salad, so no worries about over-dressing). Dig your hands in and toss the leaves with the dressing, and let the salad sit for about a half hour. At this point you can also leave the dressed leaves (and only the leaves) in the fridge overnight – they’ll continue to soften, but are hardy enough not to get soggy. 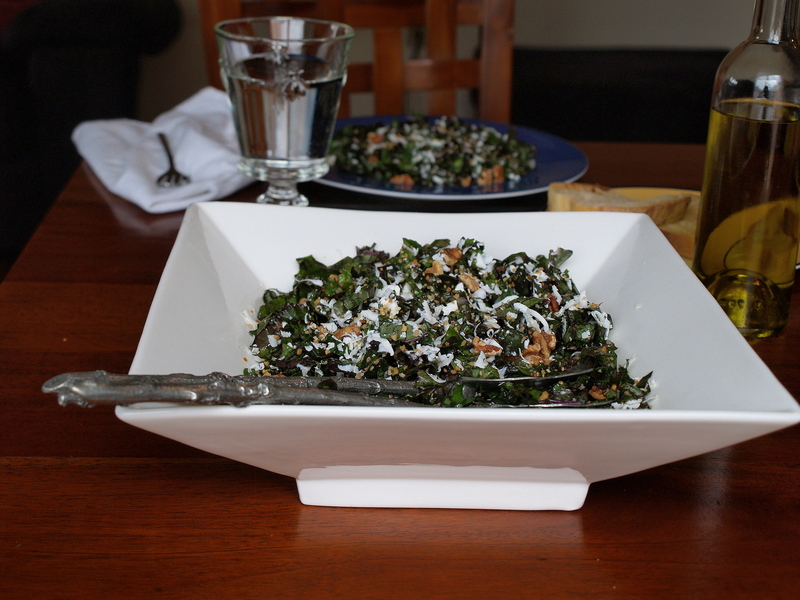 Before serving, sprinkle with the toasted breadcrumbs and walnuts and shave the ricotta salata over the salad. Give a quick toss and serve. I normally read my magazines from front to back. I might sneak a peek at the New Yorker’s cartoon contest on the last page, but for the most part, I’m a cover-to-cover gal. But when I pulled the plastic off of this month’s Bon Appétit, I jumped right to page 96 for Dorie Greenspan‘s cover recipe. She made speculoos. 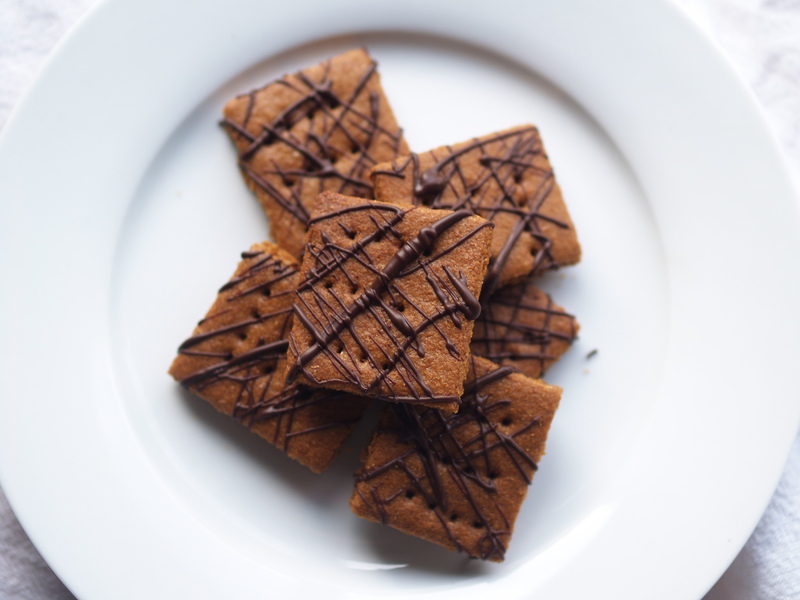 I first encountered speculoos on a flight to California. This was back in the days when you not only got stuff on airplanes, you got good stuff. Around this time, Belgian cookie maker Lotus contracted with airline food suppliers and literally flew their cookies into the US to expand their market from Europe . As we boarded that plane and struggled with our luggage, the crew handed out two thin little rectangular cookies wrapped in red cellophane. One pack per passenger. This cookie hooked me in just one bite (well, maybe two, then three, then … I stole my sister’s pack of cookies). They were crispy and delicate and caramel-y and just a little spicy and they managed to melt away in my mouth. If I first encountered speculoos on a plane, I first truly experienced these cookies visiting my friends Janouk and Regina in the Netherlands. 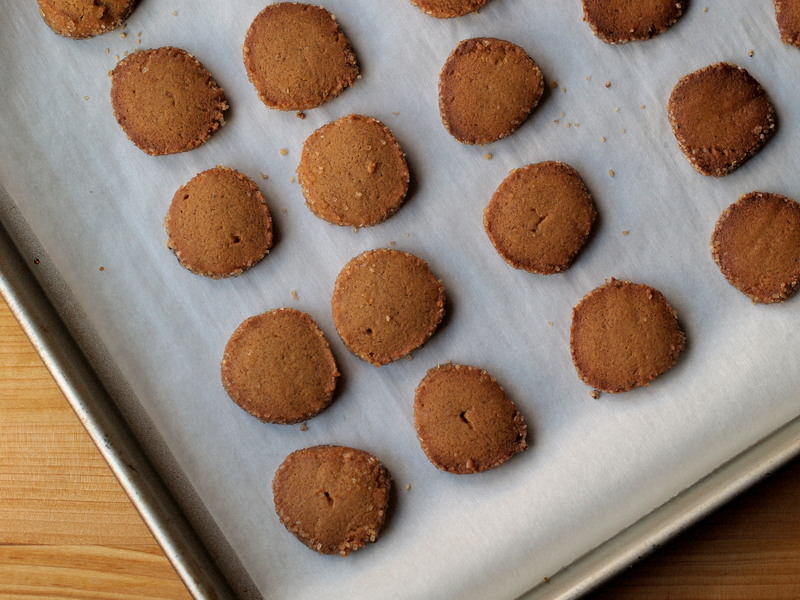 In light of that, I’m going to refer to these cookies as the Dutch do — speculaas (pron: spek/you/lahs) — going forward. I met Janouk and Regina during the summer of 2006 while we were taking a stage – a dance workshop – in Nice. We danced for 3-5 hours a day and then relaxed together afterwards — sitting on the pebbly beach, grabbing a bite (and we ate a lot more than salade Niçoise), and walking back through vieille ville, the old part of town, to our rented apartments. So, the following year at just around this time between Thanksgiving and Christmas, I flew out to Den Haag for a few days en route to Belgium. I stayed with Janouk (then a student, now a teacher), toured around a bit, shopped more than a bit, and spent a day in the dance studio, taking a few hours of class with Regina, the owner. After class, we climbed the stairs to Regina’s home above the studio and hung out like we had in Nice. 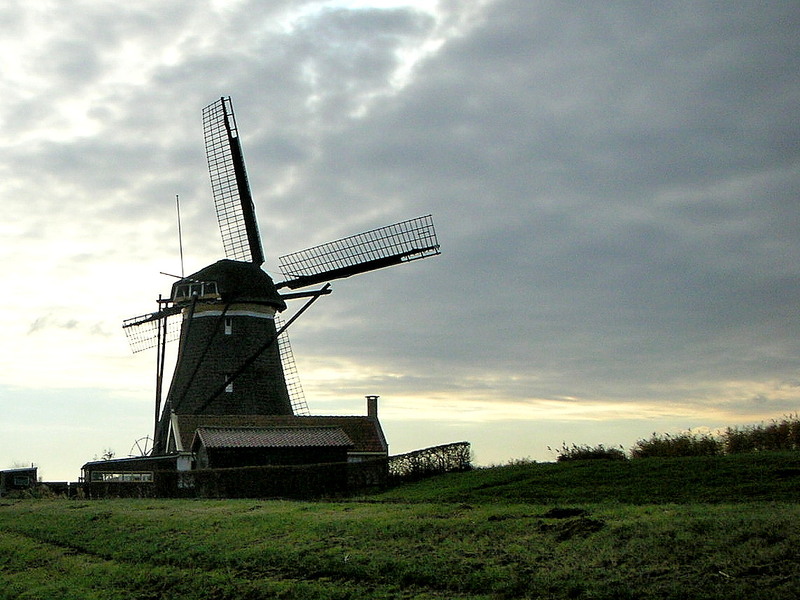 But this time, we ate Dutch food. Regina set out a few beers and tossed a big red bag to me. I caught it and tore it open, finding small button-shaped cookies inside. Regina said not to bother putting them in a bowl as they’d disappear before long. 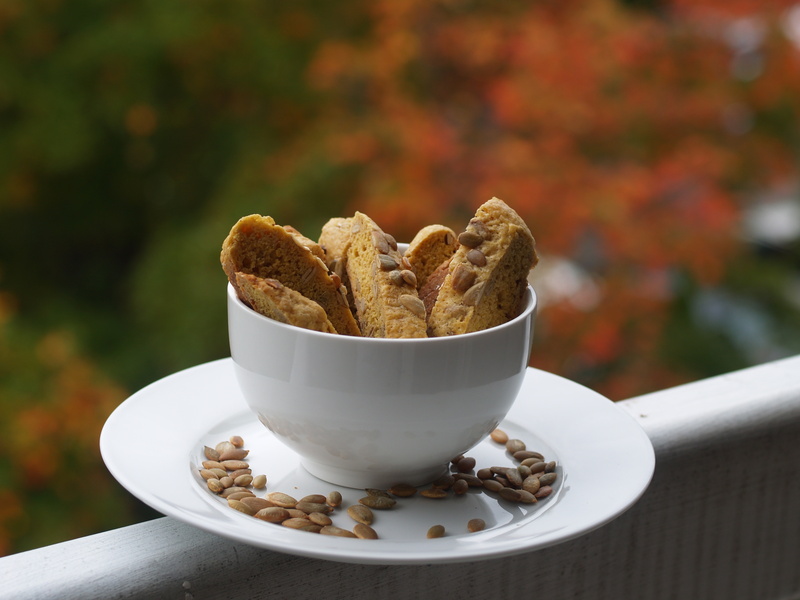 Those little quarter-sized nubbins were called kruidnoten (“spice nuts”) and had a taste very similar to that of speculaas. 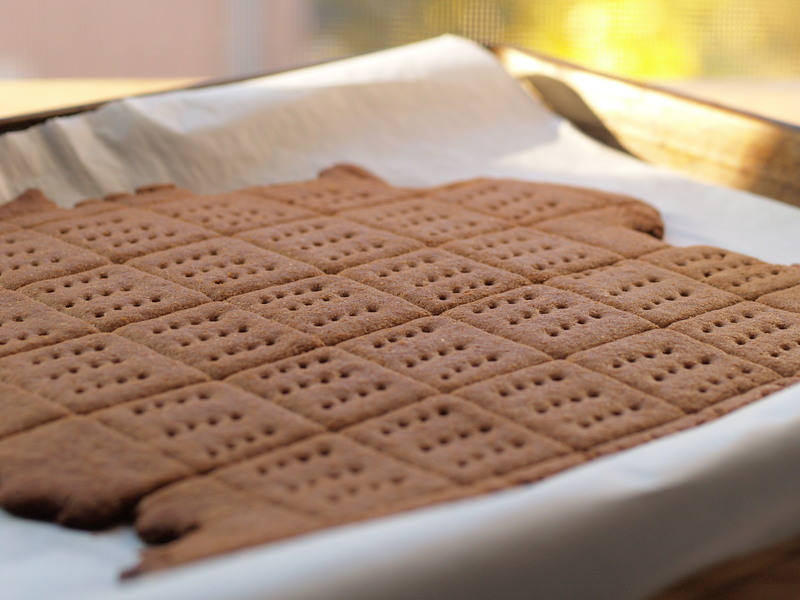 But they’re more fun that speculaas (and more dangerous) because you can wrap your fingers around about a half-dozen and pop them in your mouth as if they were seedless grapes. 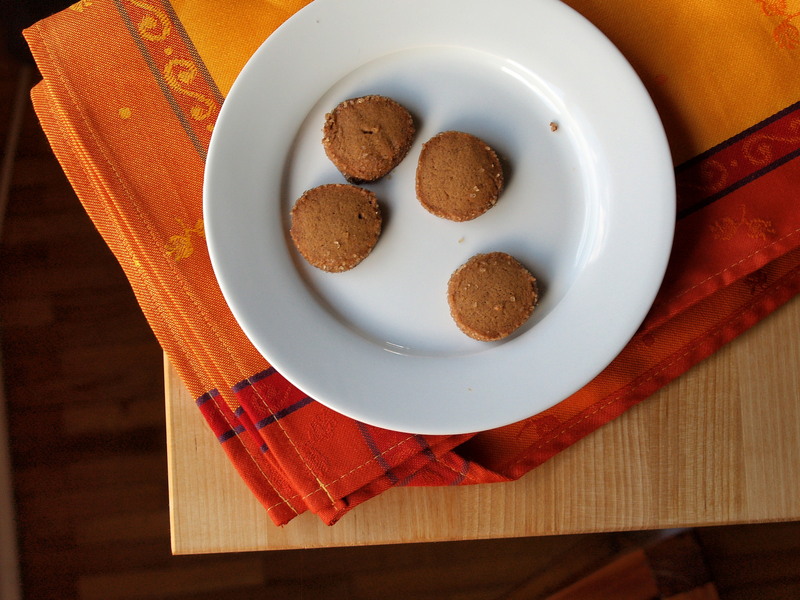 Janouk and Regina gave me a little history lesson about these cookies and Sinterklaas‘ holiday. As they tell it, Sinterklaas travels by boat from Spain (where he lives the rest of the year) to the Netherlands with several short black Zwart Pieten child servants*. They arrive on the evening of December 5th and Zwart Pieten give out candies and kruidnoten to good children. Judging by the bag we finished in one evening, we must have been very good girls that year. As I made Dorie’s speculoos buttons, I fashioned them closer to kruidnoten, a little smaller in diameter, a little higher in height. I wanted to make sure that I could grab a nice handful at once. * There is some controversy about these characters and their costumes, but that’s a topic I’d prefer not to discuss here. 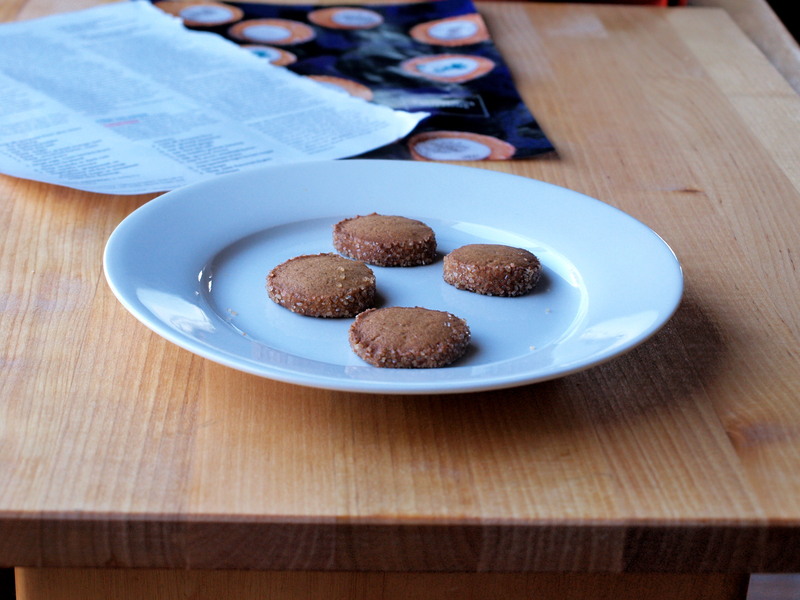 I adapted this recipe from Dorie Greenspan’s speculoos buttons recipe in Bon Appetit (December 2012). I skipped her glaze and colorful decorations, opting instead for a very humble looking cookie that really lets the spices and caramel flavor shine. I also made mine slightly smaller (diameter 1.25 – 1.5 inches) and thicker than recommended, so my yield was a bit lower than Dorie’s expected 90 cookies. I’ve kept the original directions. The main difference is that I rolled the logs a little bit longer and thinner (about 9 inches each instead of 8) and made slightly thicker cuts (on the liberal side of 1/4-inch). I might make them even smaller and thicker next time. Whisk. Whisk first 6 ingredients in a medium bowl; set aside. Beat. Using an electric mixer at medium speed, beat butter in a medium bowl until smooth, about 2 minutes. Add both sugars, molasses and honey; continue to beat until mixture is smooth and creamy, about 3 minutes. Beat in egg and vanilla; mix for 2 minutes. Mix. Reduce speed to low; add dry ingredients and mix to blend well. Shape. Scrape dough from bowl and divide into thirds. Using your palms, roll each piece of dough into an 8-inch log. Wrap logs tightly in plastic or parchment paper. Chill. Freeze the logs for at least 3 hours. (For neater edges, remove logs from freezer after 1 hour and roll on counter.) Dough can be made up to 2 months ahead, just keep it frozen. Preheat. At least 30 minutes before you’re ready to bake, arrange racks in top and bottom thirds of oven and preheat to 375°. Line 3 baking sheets with parchment paper or silicone baking mats. Cut. Whisk egg white in a small bowl to loosen; lightly brush all over 1 log. Roll in sanding or raw sugar. Using a long, slender knife, slice off a sliver of dough from each end of log to make ends flat. Cut log into 1/4 inch-thick rounds. Transfer to a baking sheet, spacing 1/2 inch apart; place in freezer while you cut the next log. (The cookies hold their shape better if you bake when dough is cold.) Repeat with remaining dough. Bake. Bake 2 sheets of cookies, rotating the sheets from top to bottom and front to back after 6 minutes, until tops are golden brown and centers are almost firm, 11-13 minutes. Cool. Transfer cookies to wire racks and let cool. Repeat with third sheet of cookies. Cookies can be baked 2 days ahead. Store airtight at room temperature. Hi there! It’s so good to be back after a few days off. My family and I gathered right outside of Philadelphia. We ate a lot (I’m sure you did too) and then the next morning, we ate some more. We stopped by Reading Terminal Market for a non-turkey lunch and a little bit of shopping. And then we had turkey leftovers for dinner. I took a camera break which was nice, though I did miss the chance to capture the trees dressed in bright red, the oak leaves nearly as large as our thirteen-pound turkey. But now life is back to normal, and today I’ve made a salad. Well, it’s a slaw really. It’s from the Deb Perelman’s The Smitten Kitchen Cookbook. It may seem odd that the first recipe I sample from a new cookbook would be a coleslaw, but this lady knows a thing or two about slaw. The cookbook itself has three slaws – one cabbage-cucumber-dill, one broccoli-almond-cranberry*, and the one I made today. Deb actually calls this one a salad — sugar snap salad with miso dressing — I suspect because half its bulk comes from sugar snaps (“mangetout”). The other half, though, is cabbage which in my mind fits it squarely into the slaw category. The word coleslaw comes from the Dutch koolsla (kool = cabbage, sla, short for salade = salad) which comes from the Latin caulis (cauliflower stem). Slaw has been around since ancient Rome and was brought to America by the Dutch who planted cauliflower seeds in New York along the Hudson. (As I write, I can’t help but hum a little ditty.) Coleslaw started out as a vinegar-based salad of raw cabbage; the use of mayonnaise is a more recent modification. Let your coleslaw sit for too long (especially out of the fridge), and you’ll be gradually approaching the fermented territory of sauerkraut and kimchi. While we’re on food history and etymology, the word salad is an interesting one too. It comes from the Latin sal (salt) and refers to dressing, which early on was a salty mild pickling brine. So, salad in essence was defined by its dressing. Which brings me to back to Deb’s salad, er slaw, and its defining dressing. 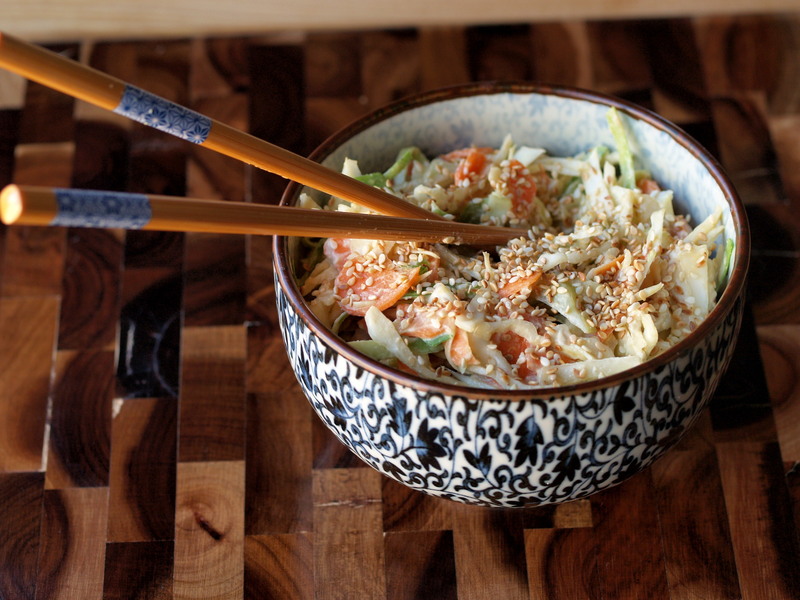 This miso-sesame dressing is magical and you don’t want to tinker with it. I reproduced it verbatim, and you should too. Which gets us (finally) back to the slaw and the dressing. On top of the miso and its umami, there is a double dose of sesame here from both tahina and toasted sesame oil. Make that a triple dose when you sprinkle the whole thing with toasted sesame seeds. The dressing is creamy and light, sticking to the cabbage, but not drenching it. It has the prefect amount of saltiness that mainly comes from the miso (no salt or soy sauce added). Dress everything a few hours in advance so the cabbage can wilt a bit as the miso and vinegar give it a quick pickle. I ate it for dinner, then lunch, then dinner again, polishing off half a cabbage in a day’s time. That’s a lot of cabbage. That’s how good the slaw is. Deb, if you can make humble slaw shine, I can’t wait to try your flat roasted chicken. And your honey and harissa farro salad. And your red wine velvet cake. Your cookbook is already floating in a sea of yellow stickies. And you, my friends, to reward you for slogging through this long (though I think fascinating) study of etymology with a side order of science, tomorrow we’ll eat some cookies. *You can argue with Deb about whether broccoli can technically be a slaw, but let’s give her a little wiggle room here. It is her book. And despite the etymology, I too have used the term slaw to refer to broccoli (and even to collards). ** Seriously, it was a coincidence. I thought the lecture was going to be about dessert. Boy, was I ever wrong. 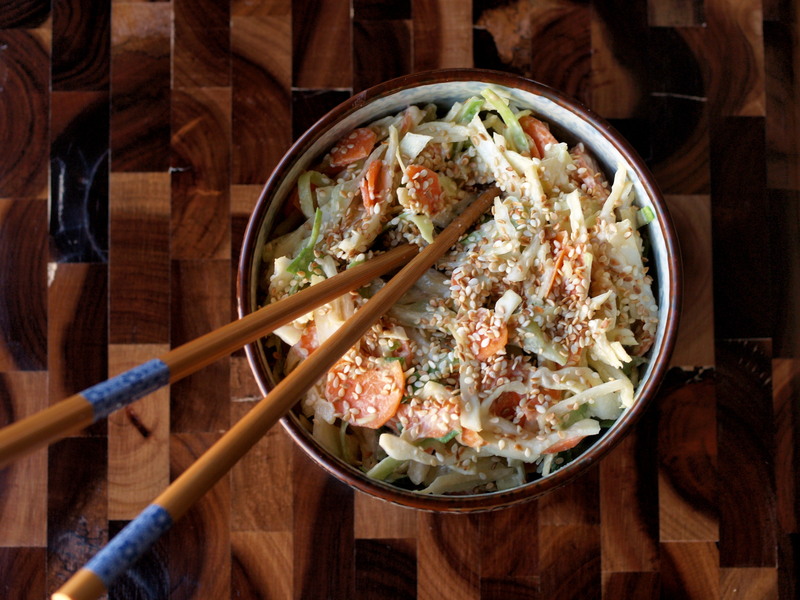 I adapted this recipe from the sugar snap salad with miso dressing in The Smitten Kitchen Cookbook. I skipped the sugar snaps and traded carrots for radishes, but kept the dressing in pristine condition (though you could add a few drops of hot sesame oil to finish things off). Dress the salad lightly a few hours before serving to allow the cabbage to wilt and soak up all the dressing, then add more dressing if necessary. I used regular green cabbage, which needs a bit more time to wilt; if you want to use the more tender varieties such as savoy or napa, dress the salad only thirty minutes before serving. Slice. Slice the cabbage, scallions, and carrots as thinly as you can with a knife or mandoline (I used a knife for the cabbage and scallions, a mandoline for the carrots). Toast. 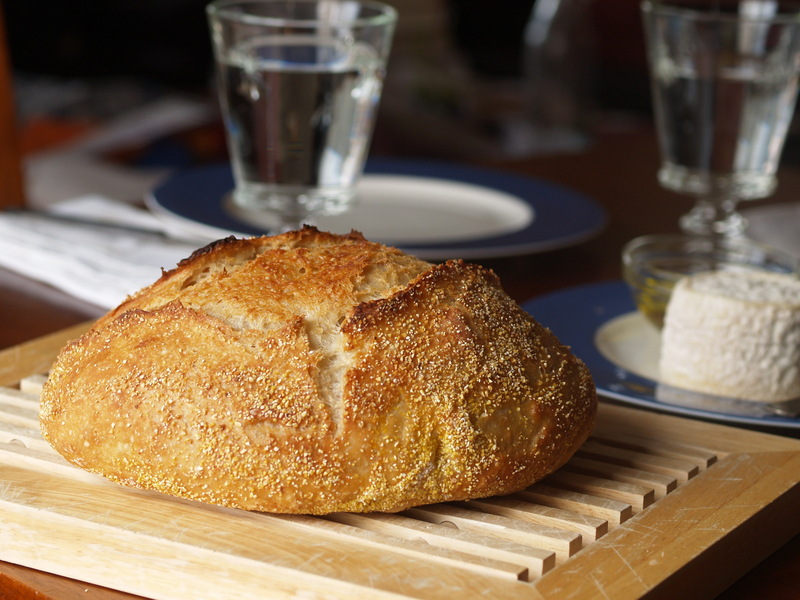 Toast the sesame seeds for 5-8 minutes in a 300ºF oven. Shake. Mix the dressing ingredients in a jar, cover, and shake well to combine. You may need to add a little water to loosen up the dressing as the tahina has a tendency to thicken, especially as it gets cold. The consistency should be similar to a thick honey. Eat. Dress the salad a few hours before serving and toss. If using more tender cabbages (savoy, napa), you’ll only need to do this about a half-hour in advance. 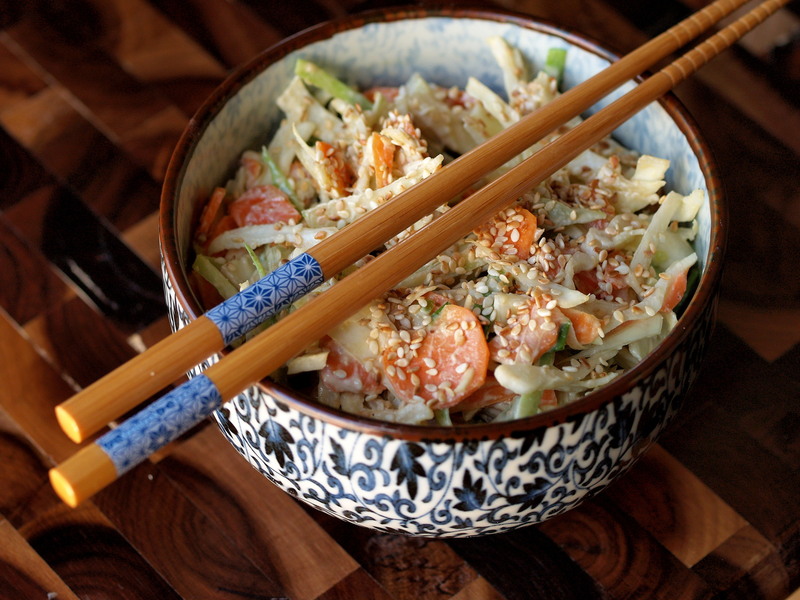 Just before serving, sprinkle the slaw with the toasted sesame seeds. We don’t have much time to chat today because I’ve got a date with an oven and a family to catch up with. Here are a few articles that I read while waiting in the airport this morning that I thought you might enjoy during your own travels. Eight Thanksgiving stories by some great food writers. Elissa Altman on being OK with change on Thanksgiving. Michael Chabon on embracing change on Thanksgiving. Fast Company on the origins of Thanksgiving and the importance of harvest. Ruth Reichl on her five favorite food books. Happy Thanksgiving, everyone. Let the eating begin! I’ll be taking off the next few days. See you back here on Monday. Well, people, it’s the night before Thanksgiving. In all the fuss about getting my pressure cooker up and running, I forgot to tell you why I made applesauce in the first place. It’s for my father. Well, and anyone else who can get to it before he does. But mostly, it’s for my father. Normally I whip together something chocolate and throw it in his general direction and he’s happy. This is the guy who used to pour Hershey’s syrup in his Cheerios. But when he was a kid, my Bubbie used to make him applesauce. I’ll be missing his birthday this year* and wanted to bring something special for him to the Thanksgiving table. So I asked him how he liked his applesauce. A little chunky, he said, not like baby food. And I used to put ketchup on it. And I’d mix it with my mashed potatoes. Potatoes I can sort of understand. You’ve got the salty and the sweet, like a mashed up version of latkes with applesauce. But ketchup? Ketchup**? No matter what he said, he could give no satisfactory explanation. When I asked if he’d be open to cranberry applesauce, he said it sounded perfect and it would look like it had already been mixed in with the ketchup. Perfect. But I’ll be hiding the bottle of Heinz 57 this year. * I’ll be in Peru for a wedding on his birthday. Stay tuned for more on that trip in January! ** Have you heard about the non-stick ketchup bottle that was developed in an MIT lab? 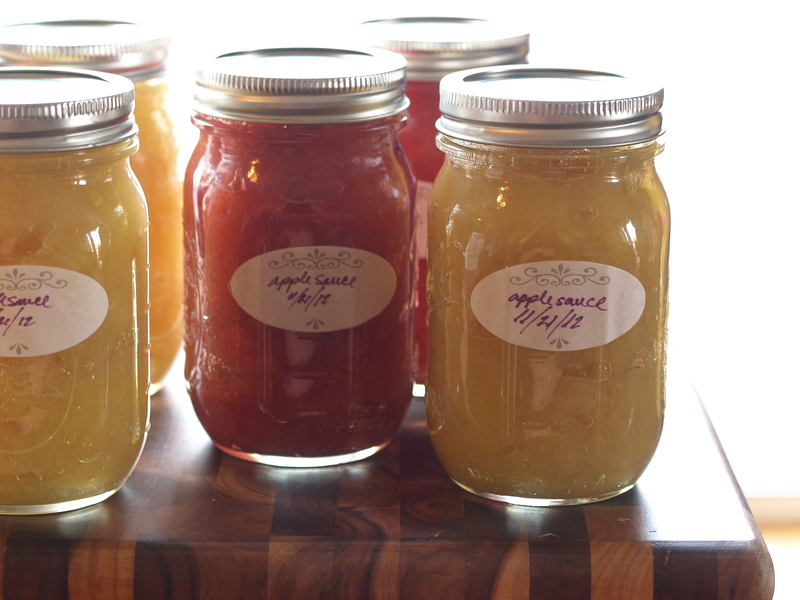 As Molly said yesterday, applesauce takes three minutes in a pressure cooker. Most recipes for pressure cookers seem to be written assuming that you know how to use one. And the cooker (my manual says I should call it the Cooker) is very straight forward once you’ve gotten used to it. But for the uninitiated, here are a few things I learned between yesterday and today about my stove-top pot-bellied Fagor and pressure cooking in general. Bring to pressure. It sounds so simple. A recipe might begin, “Mix fruit and spices in the pressure cooker, bring to pressure, and cook for three minutes.” (And actually, it might end there as well.) Bring to pressure, like it’s a pittance of a step. Here’s what they don’t tell you, people. It can take a really long time to pressurize. As a way to check whether my cooker (I mean, Cooker) was working, I decided to boil some water. I filled the Cooker with a few inches of water, did all the stuff you’re supposed to do (the lid, the lock, the valve), and waited. I watched the pot. I emailed Molly. Steam started coming out, but the indicator stayed put. The indicator. Think pop-up turkey timer (the old-school ones, not these newfangled ones). You’ve got to sit around and watch for it. With such short cooking times, you need to know when you’re pressurized so you can begin timing. Perhaps it’s different on more advance or electric models, but what’s the fun in that? So I watched the little yellow dot next to the lock. Nothing. And then. A tremble. A titter. A wiggle. And slowly the dot became a nub. But there was no pop, no noise, no way I would possibly know it had come to pressure had I not been standing and watching and watching and watching. NOTE, my manual says that the steam should start to come out after the indicator pops, but this was not my experience. Heat. Once at pressure (twenty minutes later, people, twenty minutes), you lower the heat to medium. They don’t tell you that in recipes. I found it on page 10 of the manual. You want to keep a gentle, steady stream of steam, so you might need to then adjust your heat up or down as appropriate. The cooking. This is the best part. The cooking itself goes quickly, and the Cooker cooks well. Each apples piece was the same amount of tender as the next, and we cannot attribute that to my uneven cutting skills. A quick whisk broke up all the pieces into perfect sauce. I’m not sure if it’s normal for it to take so long for a cooker to come to pressure, or if there’s something wrong with mine. I haven’t given up, Molly, but if anyone out there has any pressure cooker tips, please, please do share. Since I’m taking my applesauce on a plane tomorrow, I canned it. 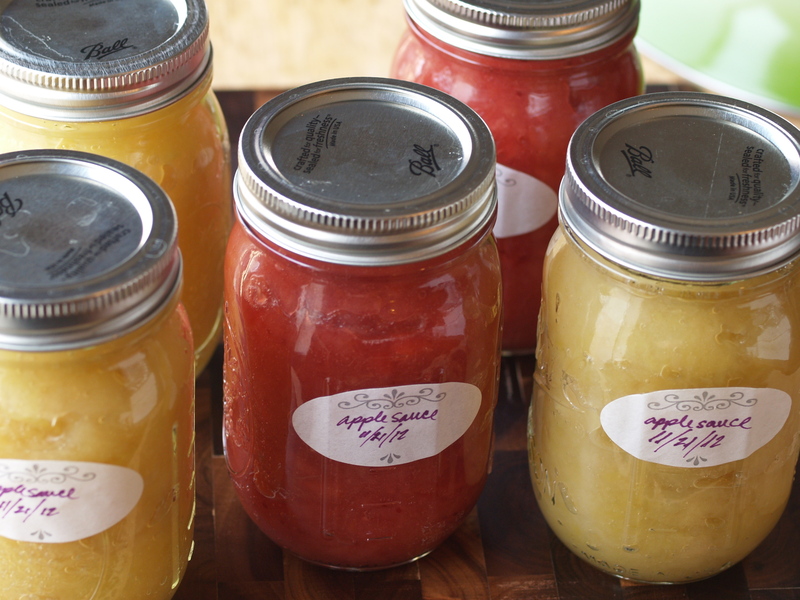 This was my first canning experience and I followed my friend Jess’s very clear instructions. 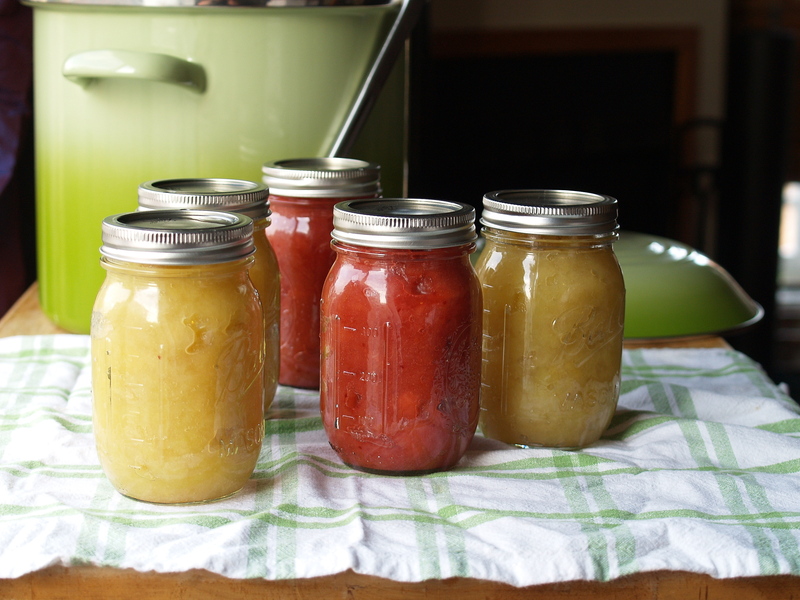 I don’t have any special equipment other than the jars themselves; I used a silicone pot holder at the bottom of the pot to protect the jars from heat, plain metal tongs to lift things out of the boiling water, and a narrow wooden spoon to scootch the applesauce into jars. 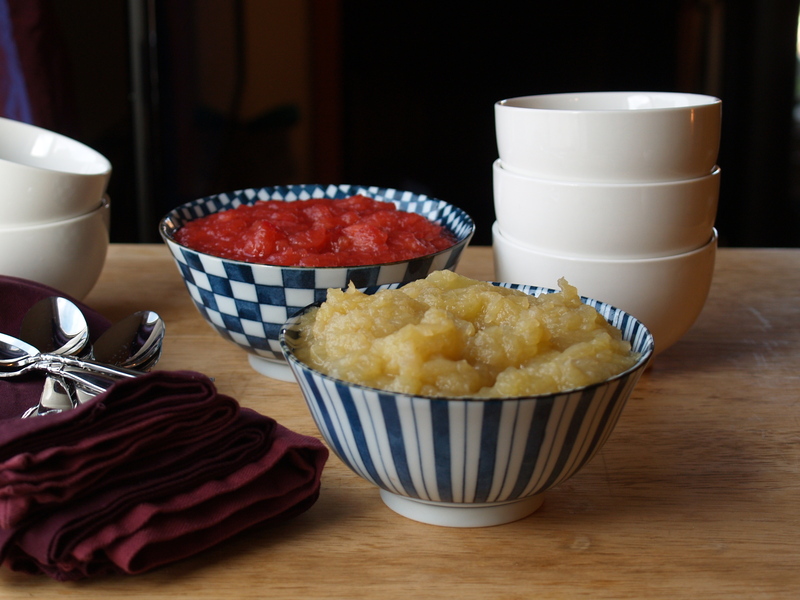 And, finally, the recipe, based on yesterday’s applesauce made-in-a-regular-pot applesauce. Again it’s good cold, but great warmed up a bit. Chop. Peel and chop the apples into approximately 1-inch pieces. Cook. Add all the ingredients to the pressure cooker. Close the lid, lock the pot, and turn the valve. Turn up the heat to medium-high. Eventually the indicator will pop and the pot will steam. Lower the heat to medium, adjusting the temperature as needed to maintaining a gentle, steady steam. Set your timer for three minutes. Whisk. When your timer goes off, release the pressure (I used the “automatic” method by turning the valve). Use a whisk to break up the apples. My friend Molly knows a thing or two about cooking. Point to a pile of green-tinged rough-hewn grains with a tilt of the head and furrow of the brow? It’s freekeh, she’ll say, and then recommend a great book about it. Need to borrow a cookbook? She probably has an extra copy of the one you want. And she’ll deliver it to your door when she’s passing through your neighborhood. Curious about the origin of that cake you’ve been making for years that seems to have come out of thin air? She’ll know. So when she suggests you buy a six-quart pot even though you already have twenty-three pots and pans for the stove top alone (eleven pots, twelve pans; I counted), your ears perk up. Two words: Pressure cooker. Sure, you’ll still have to soak them for a good long while, but cooking them will take a total of 20 minutes. And, they’ll look like wheat berries when all is said and done. Twenty. Minutes. Same goes for farro and barley. Pressure cooker is clutch…I have a Fagor one…It is, hands down, my favorite kitchen tool. What I can say is that you should get a stove top one, and not one that plugs in. There was also a lot more chit-chat in between the pressure cooker dialogue, but I’m sparing you that. A few days later, we met up for a Boston Globe food and wine event. During the Q&A portion of the afternoon, I asked the Globe’s food editor, Sheryl Julian, how I could cook wheat berries (and farro and barley) without splitting. The first words out of her mouth? Pressure cooker. I have four. Molly and the Globe food editor? A few hours later, I was in a store. I bought a pot-bellied Fagor. This soup in a pressure cooker? Six minutes. I bought the pressure cooker! I may be indebted to you for life. “Molly – I’m ready to change my life…I break out the pressure cooker tomorrow! Today was the big day. I opened my pressure cooker. I marveled at the fact that it’s called a cooker, sounding much more powerful than a mere pot. I read the instruction manual (which I still haven’t done for my camera). I familiarized myself with the parts. My goal was apple sauce. Had Molly ever made it in the cooker? Yup. It takes about three minutes once the pot begins to pressurize. Place all ingredients in the pot — your apples and spices — add enough water and pressurize. Like I said, it should take about three minutes. I was ready. I peeled and I chopped apples. I filled the cooker. I twisted the lid and flipped the lock and turned the valve. I set the whole thing on a burner, turned up the heat, and watched. There was steam and gurgling and more steam, but the yellow indicator never popped up. The cooker never pressurized. Ten minutes. Twenty minutes. No pop. I released the steam and unlocked the top, peering into a pile of mushy apples. I starting from scratch. Re-twist and re-lock top, re-twist indicator, heat back on. Ten more minutes. No pop. I again released and unlocked and peered. Thirty minutes in, the apples were nearly sauce. I pretended my cooker was a mere pot and finished off the apples. If only I was there to see what was actually happening in your kitchen with the pressure cooker. Don’t give up! Don’t worry, Molly I won’t. Tomorrow I’m trying again. But for now, here’s how to make applesauce on your stove top in a mere pot. I first tried homemade applesauce at Jess‘s and Eli’s annual Hanukkah party. 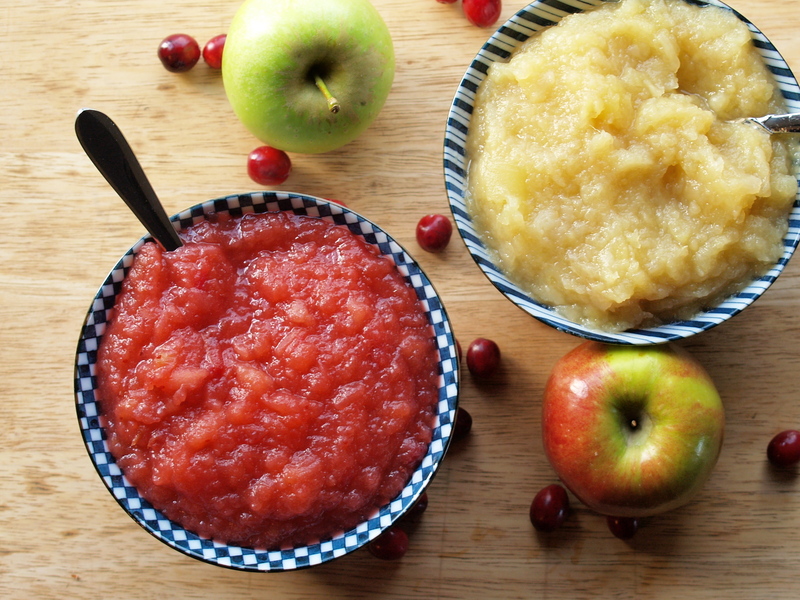 I’ve provided the ingredients for classic applesauce and cranberry applesauce, using Jess’s cranberry applesauce recipe as a guide, but significantly reduced the sugar, added a little lemon juice, and added some water because I don’t like my applesauce too thick. I made both of these versions today. The classic in the cooker took half an hour over medium-high heat; the cranberry in a Dutch oven took 45 minutes over medium-low heat. I was clearly doing something wrong with the pressure cooker! Applesauce is good cold, but great warmed up a bit. Simmer. Add all the ingredients to a large heavy pot (I used a Dutch oven). Cover and turn the heat to medium-low. Simmer for approximately 35-45 minutes, stirring every once in a while, until the fruit is very tender and starts to break down into sauce. Mash. With a slotted spoon or potato masher, break down the larger pieces of apple into small chunks. 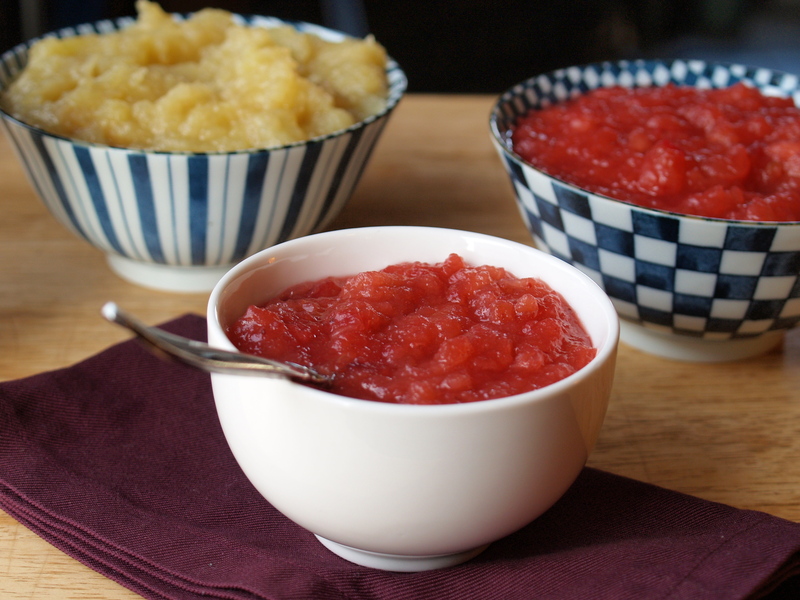 You can also puree or press through a sieve for a smoother sauce. I was just scrolling through the blog today and realized that we haven’t had salad in a while. If you don’t count the that kale and barley deal from earlier this month (Is it salad? Or is it a side? I categorized it as salad on the recipes tab, but I’m rethinking that one), the last salad we ate together was on July 13. If you’re curious, that was eighteen weeks and three days ago. I was curious. That Friday the 13th salad was unusual in that I had veered from my standard dressing of a drizzle of oil, a squeeze of lemon, salt, pepper, and I’m done. Instead, I made an orange blossom dressing that I actually call liquid gold, it’s that good. Well, my friends, I’ve found another dressing that just might just give that dressing a run for its money. This Monday the 19th one centers around pomegranate molasses. You’ve seen pomegranate molasses (also called pomegranate syrup) all over this blog. It’s in lamb and meat sauce and a roast. It glazes carrots, decorates roasted vegetables, and caramelizes tarte tatins. It has also found itself atop a bowl or two of vanilla ice cream. Pomegranate molasses is just very concentrated pomegranate juice. You can buy it in Middle Eastern (and sometimes Indian) grocery stores or make it yourself by reducing pure juice in a sauce pan until it thickens into a sticky syrup. It’s sweet and puckeringly sour. If you like sour candies, you might want to run out to buy a bottle of this stuff. Or two. But it never occurred to me to turn it into a salad dressing until my friend Jess suggested it. And now I can’t get enough of it. The first time I made, I licked the last few drops off of my plate when I ran out of bread for sopping up. Luckily I was alone at the time. Though, I might very well have done it in a restaurant full of strangers. Pile. Mix together the arugula and parsley and arrange on a large plate. Sprinkle with scallion, pear, and goat cheese. Tap. To remove the seeds from the pomegranate, slice the fruit in half, hold a piece cut side down over a large bowl, and hit the outside skin with a wooden spoon. Most of the seeds will fall out and you can gently pry out any remaining ones. Juice will splatter, so don’t wear white. Finish. 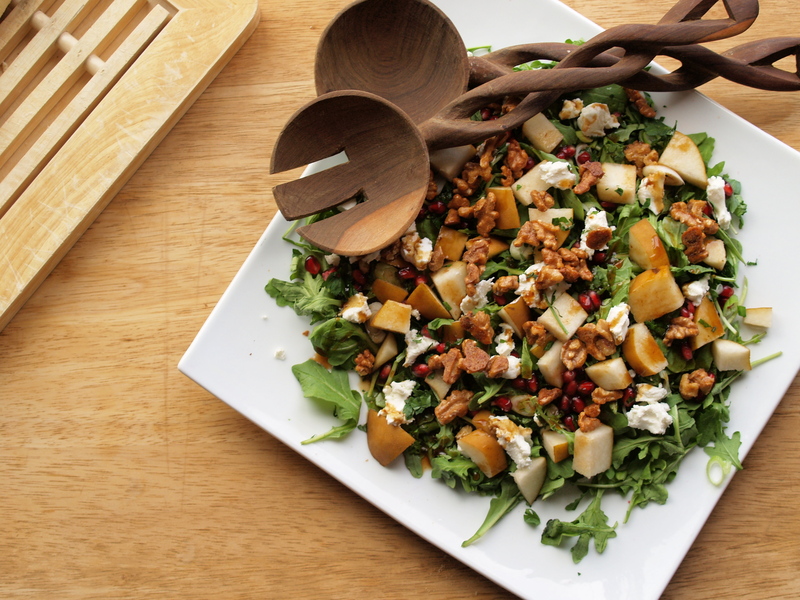 Scatter the pomegranate seeds and walnuts over the salad. Drizzle with dressing. The dressing is intense, so drizzle sparingly. Adapted from Smitten Kitchen. You’ll have leftovers, which you’ll probably end up eating by the handful. Whisk. With a fork, whisk the egg white and pomegranate molasses in a large bowl. Mix. Add the sugars, salt, cayenne, and cumin, and mix everything together. Stir in the walnuts and toss until evenly coated. Bake. 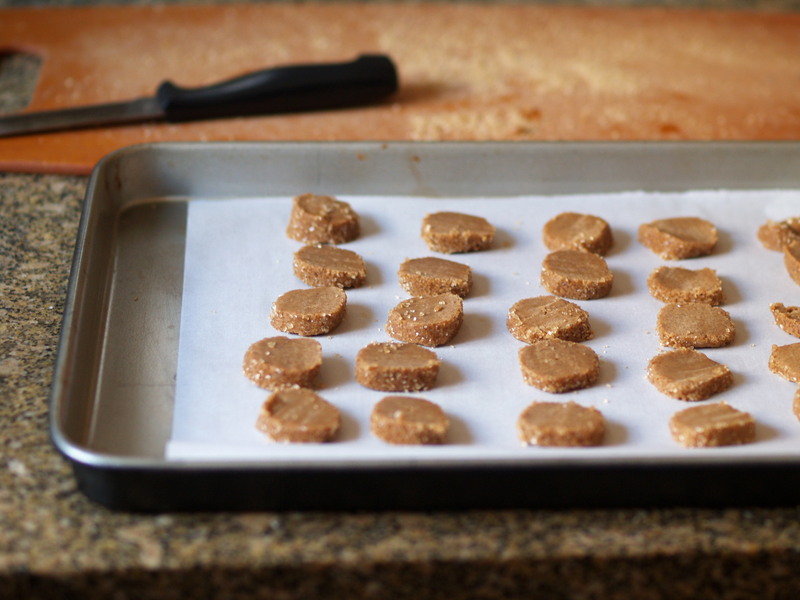 Cover a baking sheet with parchment paper, and spread the sugared nuts in a single layer on top. Bake for 30 minutes, stirring occasionally. Cool. Remove from the oven, and separate nuts as they cool. When completely cool, pour the nuts into a bowl, breaking up any that stick together. Inspired by Sweet Amandine. You’ll have leftover dressing, but it keeps in the fridge for at least 2 weeks. Shake. Put everything in a jar and shake to mix. The sugar may stick to the bottom, so use a fork to dislodge it and keep shaking. Taste. Dip an arugula leaf into the dressing and adjust the seasoning. Soup is back, and with a vengeance, people. If you include the batch that I took out of my freezer earlier in the month, I’ve eaten four different soups (well, one is officially a stew) in fewer than four weeks. And it’s not even Thanksgiving yet. Also, butternut squash is back, at least in my kitchen, and probably in yours. So, it might seem that a butternut squash soup would be on the agenda. And, that would seem to be correct. 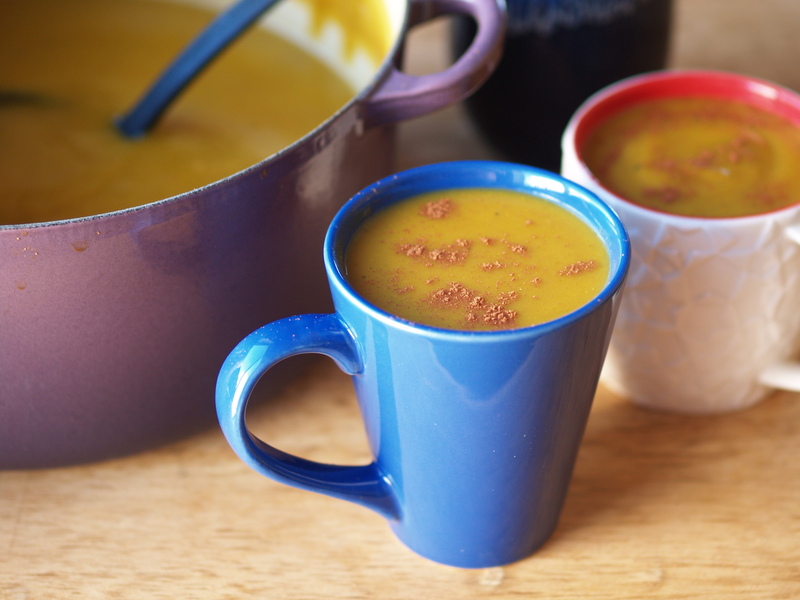 Normally around this time of year, I turn to my tried-and-true spicy butternut squash soup. I’ve been making it since grad school and this is the one I pull out of my back pocket any time someone asks for an simple soup recommendation, the one that I know by heart. My sister asks for it, my mother makes it, my new friends learn it, my old friends get tired of it. When Meira asked me for a soup recommendation a few weeks back, she audibly yawned when I suggested my old standby: I know that soup. I make it all the time. I need something new. I offered her last year’s Thanksgiving soup instead. I guess after ten years of old standby, it was time to come up with a new simple squash soup. Different enough from the first, but just as easy. Throw together in minutes, slurp in less than an hour. And spicy, it had to be spicy; I don’t do sweet squash. When a friend and her husband mumbled something about a soup made with squash and apples and curry and stuff, I went home and got to work. I peeled and chopped and stirred and sniffed. The basic formula is one squash, one onion, two apples, loads of spice. Pour an inch of stock over the vegetables, simmer for 20 minutes, whiz with a blender and you’re done. I recommend making this soup on the thinner side so you can pour it in a mug, wrap your hands around the warm vessel, inhale the steam, and let the soup coat your mouth with no interfering spoon. The spice will catch you by surprise. It will start in the back of your throat and slowly inch forward. By the time you’re tipping the mug to get the last drops, your lips will be tingling. This is a make-it-up-as-you-go kind of recipe that I based off of these three recipes. Use whatever spices you like, and if you don’t have time to experiment, just use curry powder- I’d start with 2 tablespoons and then adjust as needed. If you accidentally over-spice the soup, add 1-2 halved potatoes and then remove them before blending/serving — they’ll absorb some of the excess spice. After a day or two in the fridge, the soup will thicken slightly and the spice will intensify. If you’d like, swirl in a spoonful of Greek yogurt. Heat 3-4 T olive oil in a large pot (I used a 7 1/4 dutch oven) until shimmering (medium heat). Rough chop 2 onions and sauté for 8-10 minutes until the onions soften and become transparent, stirring every once in a while. Mince 4 garlic cloves into the pot and keep stirring for another 2 minutes. At this point, add whatever spices you’d like and mix with the onions and garlic. Here’s what I used: 1 1/2 teaspoon grated fresh ginger, 1/2 teaspoon cayenne pepper, 1 teaspoon coriander, 2 tablespoons cumin, 1 tablespoon curry powder, and 1 teaspoon cinnamon. The mix should quickly turn a mustard-y yellow (from the turmeric in the curry). Add 1 cup water and scrape the bottom to free up all the spices. Peel and seed 2 large or 3 medium butternut squash (about 4 pounds) or 3 pounds pre-peeled/seeded squash. Rough chop the squash and add it to the pot, stirring to distribute the spices. While the squash is starting to cook, peel and rough chop 4 medium apples, add to the pot and stir. Then add about 8 cups of vegetable (or chicken) stock. You want the liquid to reach about 1 inch above the level of the squash. Add more stock (or water) if you need it. Allow the soup to simmer for about 20 minutes until the squash and apples are soft. Using an immersion blender, puree the soup. You can also do this in a regular blender in several batches. Taste for seasoning, and make sure to add enough salt. If the soup seems too thick, add a bit of water; too thin, simmer for a few more minutes. 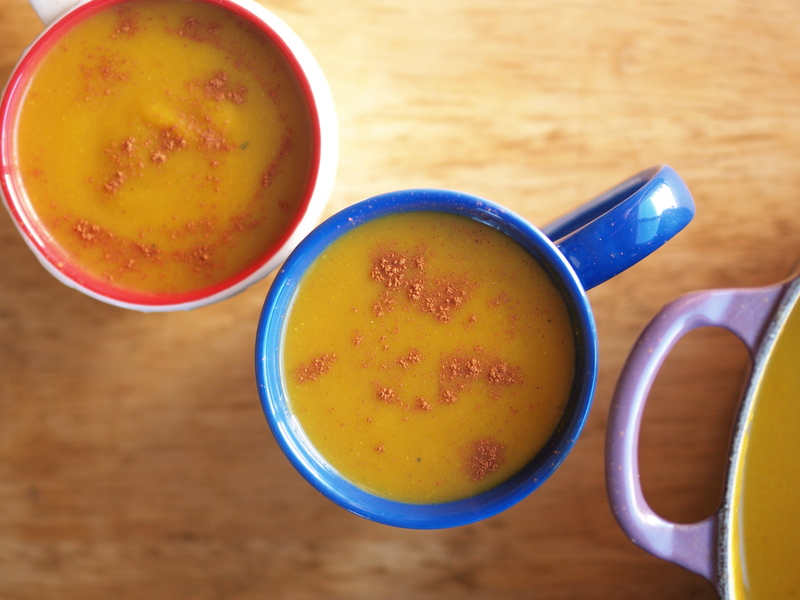 Serve in mugs with a sprinkle of cinnamon or other spice.